Take the vibe of Jamaica with the soul of Detroit and you get the Rocksteady madness of 1592. The second full length release from Detroit's original rocksteady giants 1592. Having toured throughout the U.S. this album captures the band at its high point. Tracks such as "Detroit Why" and "It's Time" highlight the sound of 1592 and why the crowds in Detroit keep coming out. Outstanding Reggae/World Recording at the 2009 Detroit Music Awards lead single "That's It" appears on this follow up to the Great Stuff Award winning album "The Rise of the Fallen" and showcases the groups feel and soul. 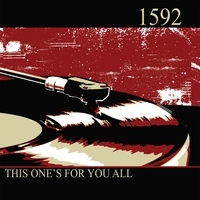 Check out this album and the debut album from Detroit's rocksteady greats 1592.